Hi I am having trouble setting the scale on interval data to accept small numbers. In the case of permeability, often we need to plot numbers at 10-7 decimal places for example. However RW only allows me to input numbers at 10-6 and defaults to 0 if they are smaller. 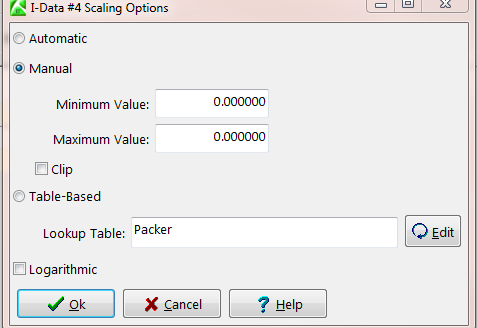 I have changed my program settings to allow for more decimal placed but the I-data scaling still will not take the low values I need. Thoughts? The current version of RockWorks limits the precision to 6 decimal places, so you may need to multiply your values by a factor to have them fall in this range. For example, you could multiply by 1000 to convert permeability from darcys to millidarcys or by 1,000,000 to display "microdarcys" as the units. Programming says that they will add the ability for more than 6 decimal places in a future version. Ok thanks for the input Tom. Our organization and clients like to see permeability units reported in cm/sec but based on your comment that may not be possible for low perm data. I think moving forward we will report the perm in Lugeons, unless there is any other way to trick RW into plotting these low values that you can think of.